By 2022, the proximity marketing market is estimated to be worth USD 52.46 billion. And, with the growing emphasis on improved customer experience, SMBs must make efforts to incorporate proximity marketing in their marketing arsenal. Instead of singling out only one proximity channel, a smart move is to implement a combination of two or more to ensure that every customer – loyal or new – has a consistent in-store experience. And exactly how important is a positive store experience? According to Forbes, 59% of the shoppers reported that a bad experience resulted in them boycotting the company altogether. While at its heart, proximity marketing remains a subtle way of selling more and bringing in a higher ROI, there is a lot more to it than just coupon codes and discount offers. Before we broach the subject, let’s focus on what each of these technologies can do. How can NFC assist SMBs? NFC or Near Field Communication has always been equated to cardless payments when in reality NFC can be implemented in several instances. NFC requires two devices to communicate in a short range. One that transmits the signal and the other that is able to receive the signal. Information is sent over radio waves and NFC is based on older RFID technology. Most Android smartphones and the newer iPhones have native compatibility. There are also third-party apps that allow smartphones to read NFC tags. NFC tags can be attached to the products in-store to enable customers to pick up and learn more about products. Information about product specifications, features, and best-by dates can easily be dispensed. Tommy Hilfiger’s radical approach to smart clothing can easily be replicated with NFC tags. The idea is to reward customers each time they wear an article of clothing. This results in gamification of the process while building a loyal customer base. Consumers can be encouraged to tap on NFC tags to join loyalty programs. 71% of consumers say that their membership in the loyalty program is a very important part of their relationship with brands. NFC makes it incredibly easy for consumers to try on clothes in their size. Tags attached to a mannequin can be tapped on by consumers which alerts the salespersons who can then bring the required items directly to the trial rooms. Android Pay and Samsung Pay are prime examples of the wonders of NFC. Instead of wasting time swiping a card, customers are able to cut down on waiting times in long queues by tapping their phone to the POS system. NFC stickers can also help customers learn more about a product by tapping the sticker. For instance, when a shopper purchases a DIY item that requires intricate explanation, an explainer video can be attached to the sticker making for a very smooth experience. QR or Quick Response codes have been around far longer than NFC but has only recently emerged as an effective proximity marketing channel. What is QR code and how does it work? QR codes are two-dimensional matrix barcodes which can store data. A smartphone or a QR code scanner scans this code and displays information. iPhones and most Android phones have native compatibility and don’t require an app to scan QR codes. QR codes make cashier-less checkouts a staunch reality. Decathlon has recently launched a pilot Scan and Go feature in one of their outlets in Bangalore, India where customers can scan products to add it to their cart, scan their smartphone on exit and have all the items delivered to their homes. Zippin, a Amazon Go rival, is playing a major role in automating stores. Long lines at the checkout counter significantly increase cart abandonment statistics. Since QR codes work seamlessly, they can be used to entice shoppers with discount codes, deals and seasonal offers. 96% of customers use coupons and making it digital not only enables customers to keep track of their savings but also cuts down time at the checkout counter where paper coupons have to be manually scanned. Scores of educational walking trails have implemented QR codes to disburse detailed knowledge to consumers. Parc Bute Park is a shining example of this. Taking inspiration from this, SMBs can design a ‘trail’ that allows customers to have a more wholesome experience. QR codes can allow businesses to show consumers creative adverts pitching auxiliary products to engage customers inside the store. Spotify codes when scanned take consumers to a specific playlist. Businesses can use these codes and have customers scan different codes to play curated playlists. SMBs can extend their proximity marketing efforts by printing out QR codes on wearables like T-shirt or gift items like mugs to engage with new customers and essentially turning every existing customer into a personal brand ambassador. Use QR codes to allow customers to scan and re-order items they have already purchased. This serves to increase post-purchase engagement and sales. QR codes do not need to be in black and white. In fact, 30% of the code can be left out or distorted to allow for creative leeway and still be readable on smartphones. For instance, if SMBs wish to promote app downloads, they can print out QR codes that stay true to the color scheme of the app. It is also possible to use them in lieu of a logo to either direct customers to the store, text or call the business. BLE beacons have an advantage over QR and NFC because it does not require customers to be in close proximity and have a range as far as 300 meters. Beacons work in tandem with a beacon-aware app. Beacons are Bluetooth transmitters. A beacon aware app – a third party app like NearBee on iOS and Android or a brand app – scans for beacon signals and displays notifications on smartphones. If building an app sounds scary, try our DIY solution that allows you to create an app within minutes. NearBee is compatible with both Android and iOS devices. Brand apps can be targeted at Android users or iPhone users or both. BLE beacons along with a compatible app are an excellent way to entice customers with discounts, deals or relevant offers. 97% of consumers always look for good deals during shopping and 92% of consumers search for deals all the time. Beacons can be used to grow an SMB’s social media presence. Clicking on a notification can take users to the business profile on Facebook, Twitter or Instagram allowing them to connect with the business. Just like with NFC and QR codes, beacons play a significant role in getting customers to use digital coupons and even save them to their wallet for later use. Mall of Denmark came up with an ingenious idea to keep children occupied by engineering a scavenger hunt using beacons. They were able to collect points and redeem them for toys. Want to create a scavenger hunt? This is how you can get started! Beacons serve as a non-intrusive way to get customers to provide their valuable feedback and use that to build inventory. The Amazon 4-star store utilizes customer reviews and ratings online to ascertain the store inventory. SMBs can start incorporating these different channels depending on the use case and the complexity of the implementation. For instance, cardless payments are where NFC shines. QR codes do a terrific job at engaging with new customers. Beacons and the beacon-aware app are able to collect meaningful data about how successful a campaign is, change it in real time and have retargeting capabilities. 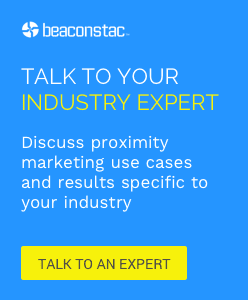 QR codes and NFC facilitate proximity marketing without an app whereas beacons can be used to offer a tailored experience, loyalty programs and personalized recommendations using a beacon-aware app. The Beaconstac dashboard also has a nifty feature wherein every campaign is associated with a QR code making beacons and QR codes work seamlessly. A healthy mix of all three channels can propel SMBs to gain new customers and retain loyal ones.